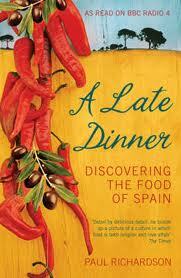 This 2007 book – A Late Dinner: Discovering the Food of Spain – was written as a travelogue by journalist Paul Richardson. He travels all over Spain detailing the regional food and ingredients he finds, taking the reader past the clichés of paella and gazpacho (delicious as they are) to other food – dishes that haven’t changed for centuries. Beginning in coastal areas like Valencia, Cádiz, Málaga and Galicia – he then heads inland to Jaén, Granada and La Mancha – ending up in Barcelona and Madrid. He weaves food into the country’s history, how people lived – and paints an evocative picture of remote parts of Spain and the busy cities. He visits (now closed) elBulli and arguably the home of Spain’s finest cuisine, San Sebastián. It’s full of lovely food from roast squid with piste manchego to fresh pea omelette and habas con jamón. And suckling pig. There’s a list of his favourite restaurants by region. Read it and you’ll be on the next plane, in time for supper.